Maine’s Penobscot River is Maine’s longest, steepest whitewater rafting river and the most thrilling and technical whitewater rafting in the eastern United States. Northeast Whitewater knows the Penobscot River like no one else and we play the Penobscot River harder than anyone else. But we make sure that in between the big water and the pool drop whitewater rapids, you get to take in the stunning scenery, and maybe even a Maine moose. The West Branch of the Penobscot River runs right through Maine’s famously “forever wild” Baxter State Park, and make no mistake, it is one wild ride. There is no more exciting way to see Maine’s wild places or wildlife than from a Northeast Whitewater raft. With amazing views of Mt Katahdin, heart pumping whitewater and challenging rapids, you don’t want to miss out on Northeast Whitewater Penobscot River Whitewater Rafting Trips! Northeast Whitewater is a small rafting company that offers big adventures with small groups on personalized whitewater rafting down the West Branch of the Penobscot River on our Penobscot River Gorge and the Cribworks Section trips. This stretch of the Penobscot River has high water and dam-controlled water flows, so even the most dedicated whitewater rafting thrill seekers will always get their fix. Steep and technical, these Penobscot River whitewater rafting trips have Class III – Class V rapids, ten-foot waterfalls, powerful holes, surfing and many more thrills along the way. And one of the biggest thrills is the breathtakingly beautiful Penobscot River scenery you’ll take in as the whitewater rapids take us along. Northeast Whitewater also will customize our traditional Penobscot river whitewater rafting trip for summer camps, boy scout troops and youth programs to raft the Penobscot river lower trip. Learn more about our Penobscot river lower whitewater rafting trip youth programs at our Summer Camp Experience. But for some whitewater rafting junkies, that just isn’t enough. We can’t get enough of Penobscot River whitewater ourselves, so we created our Double Trouble Penobscot River whitewater rafting package. When you sign on for Penobscot River Double Trouble, you get to run the Penobscot River Gorge twice! No flatwater sections, double the Class V whitewater rapids and a multiple Penobscot River Gorge experience. This is an unforgettable whitewater rafting run, and a true white-knuckle ride. Still not enough? We get it, and we’ve got you covered. Northeast Whitewater is the only Maine rafting company to offer the Penobscot River Sport Raft. The Penobscot River Sport Raft is the smallest raft on the river. Everything looks and feels bigger and is only recommended for the adventurous, more aggressive rafting guest. For even more whitewater rafting excitement, add another Maine river to your Penobscot River rafting run. Ask about Northeast Whitewater’s Two Rivers in Two Days discount packages. 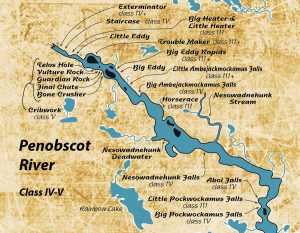 If you’re ready for the Penobscot River, the Penobscot River is ready for you from May through October. Call Northeast Whitewater to set up your Penobscot River whitewater rafting adventure today 1-207-695-0151! * Add an additional $20 per person for a ‘double trouble trip’. Northeast Whitewater provides all the equipment you need for your Penobscot River whitewater rafting trip, including state-of-the-art self-bailing rafts, Type V lifejackets, paddles, helmets and safety equipment. Wetsuits are available at an additional cost and are required on some whitewater rafting trips on the Penobscot River. Every boat on a Northeast Whitewater Penobscot River whitewater rafting trip is helmed by a Registered Maine Guide. Northeast Whitewater provides the local transportation for your Penobscot River. A user fee of $6.00 to cover road access to the Penobscot River and a State of Maine head fee is added to each whitewater rafting guest. 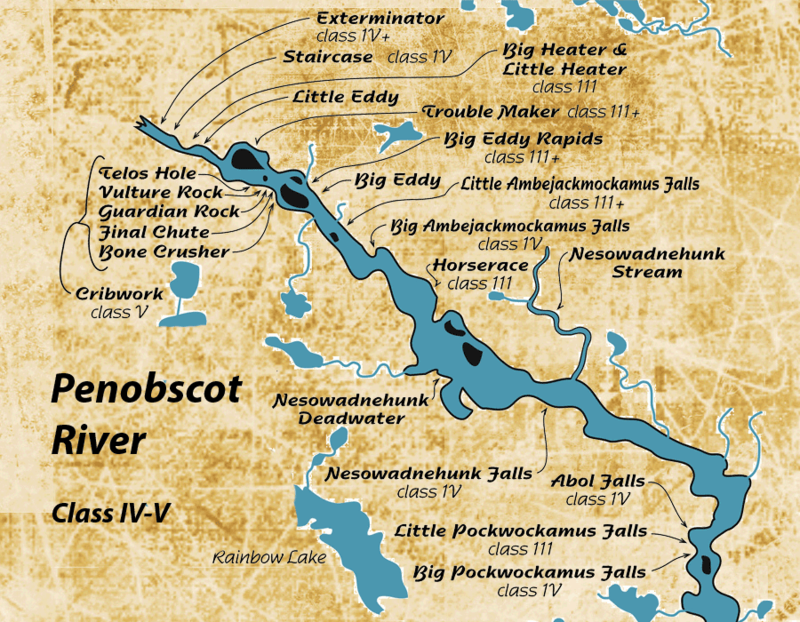 All Penobscot River rafting trips meet at the Northeast Whitewater Moosehead Lake Basecamp at 8am. Our famous river lunch is included in your Penobscot River whitewater rafting adventure. Northeast Guide Service screens a photo slideshow of the day’s whitewater rafting adventure (available for purchase). Video is available on any Penobscot River whitewater rafting trip at an additional cost and must be requested in advance. We pride ourselves on small, personalized trips. Northeast Whitewater requires a minimum of eight participants on guided Penobscot River whitewater rafting trips. If your party is less, you can join an existing whitewater rafting trip. Northeast Whitewater is the only Maine rafting company to offer the Penobscot River Sport Raft. The Penobscot Sport Raft is the smallest raft on the river. Everything looks and feels bigger and is only recommended for the adventurous, more aggressive rafting guest. Sport rafts guarantee that you will have your own raft, and are driven by only the most experienced Northeast Whitewater Registered Maine guides. We were in Greenville for a few days and experienced your whitewater rafting. We were very impressed. The rafting was exhilarating! Most of all we were grateful for your excellent staff who really enriched our trip. They were attentive, confident, and full of all sorts of interesting information. Thank you so much for providing a wonderful service. We will treasure our memories.